1831 Entire from Salisbury to Launceston showing a very fine MANUSCRIPT "MISSENT to" FOLLOWED BY A VERY FINE CIRCULAR UNDATED 'PENRYN' WITH MILEAGE REMOVED. 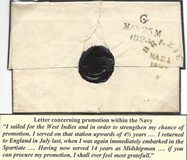 1908 Stationery cut-outs used on envelope to London cancelled by SUPERB RILLA.MILL cds. 1857 Small 1d Pink envelope addressed to Launceston and showing a very fine FIVE LANES (under Launceston) undated circle. 1810 Entire addressed to London from Corunna with, on the front, a fine FALMOUTH town handstamp in Red. 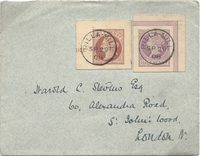 Also on the front is a Postage Due for 2/9d - treble letter, Falmouth to London 11d x 3. 1849 Envelope addressed to Falmouth showing on the reverse a fine FLUSHING (under Falmouth) undated circle in Red. 1840 22 June cover addresseed to Taunton with, on the front, a fine two-line PAID AT/LAUNCESTON in black. 1811 Entire from Corunna addressed to London, posted by forwarding agent Foxes & Son suggesting that it was therefore carried by private vessel to Falmouth. 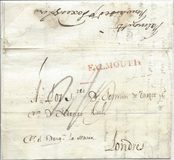 On the front is a very fine FALMOUTH town handstamp in Red together with Postage Due 2/9d. 1834 Entire addressed to Redruth cancelled on the reverse by a very fine ST. AUSTELL undated circle. 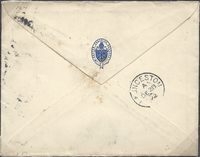 1849 Small envelope addressed to Launceston with, on the front, a fine WADEBRIDGE undated circle. 1833 Cover addressed to Redruth showing on the front, a fine circular undated 'PAID AT TRURO' in Blue. 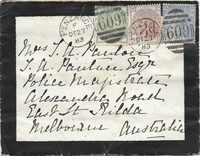 1855 Entire addressed to Plymouth with, on the reverse, a FIVE LANES (under Launceston) undated circle in Blue. 1831 Entire addressed to London showing on the front, a very fine two-line 'St. GER/MANS' in black. 1825 Entire addressed to Liskeard containing a Credit Note for £400 cancelled on the reverse by a TRURO/260 mileage in Blue. 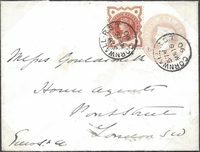 1855 Cover addressed to London franked by a 1d Red-Brown, SG 29, and showing on the reverse a very fine MAWNAN-SMITH (under Falmouth) undated circle. 1845 1d Pink Stationery envelope addressed to Plymouth and cancelled by a (Wessex-type) LISKEARD circular datestamp. 1848 1d Pink envelope addressed to Liskeard showing a LOOE Undated Circle. Circa 1815 Cover to Liskeard showing a very fine LOSTWITHIEL/249 mileage, CO 186. 1829 Entire from Arequipa, Peru, addressed to London showing on the reverse two very fine MARAZION/SHIP LETTER, Robs S2. Very Scarce. 1851 1d Pink Stationery envelope to Liskeard from Stockport showing a superb circular MISSENT/TO/TRURO in BLUE. 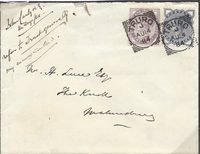 1873 3d Rose, SG 103, Plate 10, tied to cover from Falmouth to Paris. SCARCE Plate 10. 1837 Entire from London Stamp Office to Camelford showing a SUPERB MISSENT/TO/TRURO in blue. 1840 Entire from Barcelona to Bath showing on the reverse a very fine 'CADIZ/F' in Green of Falmouth. Contents refer to siege off OPORTO and the fact that all who served in the Army retained their ranks, etc. 1834 Entire to Redruth with a superb HAYLE undated circle. 1793 Cover to London showing a fine straight line TRURO, CO 351b.